First Priority Bank if offering a 1.50% APY savings account rate that is guaranteed through September 30, 2011. First Priority Bank if offering a 1.50% APY electronic savings account rate that is guaranteed through September 30, 2011. That's one of the best savings account rates according to the BestCashCow rate tables. The downside? Only residents of NY, NJ, and PA are eligible to recieve the rate according to the CSR I spoke with. In addition, First Priority is dedicated to concierge service. That usually means they service higher net worth individuals like a private bank. It's unusual to have such a competitive rate that is also guaranteed for a period of time. After September 30, First Priority can adjust the rate downward. To get this rate, the account must be opened online and you must also opt-in to receive e-statements. According to the CSR, the account can be funded via an ACH. The minimum balance for this rate is $7,500. You'll earn .50% APY for balances from $50 - $7,499. The bank holds $280 million in assets and operates five branches in Eastern PA, new the New Jersey border. It's Texas Ratio of 24.7% (see what Texas Ratio means) is slightly higher than the national average and it has a Return on Equity of -3.81 % versus the national average of 7.75%. The bank is FDIC insured. The chart below provides a quick comparison of several different asset classes that produce income for investors. It includes assets deemed to be almost totally safe, such as FDIC-insured savings and CD accounts and U.S. Treasury Securities, to assets that introduce more risk, such as dividend stocks. Many accounts require only $1; very liquid. Transaction costs; no guarantee of rate stability if short term rates decline. Rates as high as 2.50% in nationally available online accounts. For FDIC insured banks, the standard deposit insurance amount is $250,000 per depositor, per insured bank, for each account ownership category. Fully taxable in the year of accrual. Provides a guarantee of income should short term rates fall. Rates for longer term CDs are higher than savings accounts. Not liquid for term of CD (without significant penalty). APY rates may be slightly higher than online savings accounts for terms of 1-year and longer. Top online 1-year CDs pay 2.85% APY. Some online 2-year CDs pay over 3% APY. Local rates at banks and credit unions near you may be higher. Fully taxable in year of accrual. Often difficult to find a FCU for which you qualify with the products you want. Depends on particular FCU and duration but often higher than big banks. Rates are comparable to those offered for equivalent products by banks. For NCUA insured credit unions the standard deposit insurance amount is $250,000 per depositor, per insured bank, for each account ownership category. Rates have not been very competitive with alternatives; yields may not rise as quickly as some alternatives if short term rates rise. Retail funds as high as 1.80%. Only valuable for ultra high net worth individuals, corporations, and not for profits at the moment. Since these rates have not been competitive for years, money market funds are not recommended at all for individuals. Not insured. Although very rare, principal invested may fall below par ("break the buck"). Usually very liquid; most beneficial to those in the higher federal and state tax brackets. If tax advantages are fully utilized, the effective return is ordinarily above that of fully taxable alternatives. Approximately 1.50% in yield for funds geared to a 10-year duration. For investors in the highest federal tax bracket (35%) who are residents of high tax states may be equivalent to a fully taxable yield close to 2.50%. Although very rare, principal invested may fall below par ("break the buck"). The US Treasury, however, has guaranteed that the principal deposited in qualifying 2a-7 funds as of September 19, 2008 will be insured for one year. Fully tax free provided that you are a resident of the appropriate state for the entire year. Differs according to duration. Compare Treasury rates. Currently 2.90% for 10-year Treasury. Not subject to state and local taxes. Absolutely not liquid for 1 year; penalty of 3 month interest forfeiture if redeemed in fewer than five years. Maximum purchase is $10,000 per calendar year per individual in electronic format (may also purchase up to $5,000 per year using a Federal tax refund. 2.83% for new bonds through April 30, 2019, reset bi-annually based on CPI-U thereafter. Not recommended until fixed rate component becomes significantly higher than its current rate of 0.50%. No risk to principal; backed by US Full Faith and Credit. Not subject to state and local taxes. Since interest accrues, federal tax is deferred until redemption. Approximately 0.80% on the 10-year TIPS. Not subject to state and local taxes. Interest is fully taxable in the year in which it is paid. Phantom interest is taxable in the year in which the bond's principal appreciates in accordance with changes in CPI-U. Usually very liquid. Benefits are greater for those holding state and local tax exempt agency bonds in highest tax brackets of highest taxing states. Callable agencies may offer a substantial yield premium over other short term securities. Longer term agency bonds may lose value very quickly if interest rates rise and bonds are not called. Long-term callable state and local tax-free bonds with 3.00% coupons are trading, but may trade below par value if rates rise before bond is called. Risk to principal may exist; may trade at values significantly below par before maturity. Certain agency bonds are not taxable at the state and local level; interest is federally taxable in the year that it is paid. Usually very liquid; yields often exceed after tax yields for taxable bonds and cash equivalents for investors in higher tax brackets. Even the shortest term bonds may lose value if interest rates rise. Current average 10-year yields at 2.30%, which is an after-tax equivalent over 3% for someone if a 28% Federal tax bracket. Default risk (risk to principal) exists (mitigated for pre-refunded municipal bonds); may trade at values significantly below par before maturity. Usually not federally taxable, and usually state tax free to residents of the issuing state. High quality Dow Dividend Stocks can offer yields between 3-5%. Stocks price can drop and investors can lose principal. Investor can lose all of their principal. Tax rate on qualified dividends is 0% to 15%. To be a qualified dividend, investor must "must have held the stock for more than 60 days during the 121-day period that begins 60 days before the ex-dividend date." This chart may be shared and forwarded to others. It can be posted on other sites as long as the following link is included in the article or post as attribution: Comparison of Savings Accounts CDs, Treasuries, Munis, and Other Safe Investments – BestCashCow. We all know that savings account rates have been on a path to nowhere over the last three years since the start of the global financial crisis. Back in 2007, savings rates were as high as 6% but now the average is closer to .50% APY. But with a little bit of research, you can still find savings accounts at 1% APY and above - some even higher than 1.50% APY. CNB Bank Direct - CNB pays 1.15% APY on an online savings account, the highest rate in the country according to the BestCashCow rate tables. It requires $1 to open and and start earning interest. The online bank is a division of The Citizens National Bank of Bluffton. American Express Savings - Personal Savings from American Express is offering a 1.00% APY online savings account. The bank has consistently received positive reviews from users and generally keeps its rate in the top 10. It's easy to open an account and there are no minimum balance requirements. Aurora Bank - Aurora bank pays 1.06% APY but it requires a minimum balance of $100,000. While I realize most of you do not live near these banks or aren't eligible to join the Aflac credit union, almost every state and zip code in the country has a bank that is paying significantly above the national average. 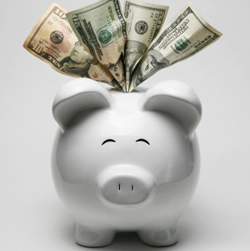 Click the "Savings" tab above to view savings account rates in your local area. There no reason to stick with a low rate when FDIC insured banks are offering to pay more. Help yourself and your pocketbook by looking to get more for your savings. The credit card giant now offers a 1.00% online savings account, with no fees and no minimum deposit. They also offer no-minimum deposit CDs. When you say the name American Express, most people think of a credit card. That’s not surprising, considering there’s over $620 billion worth of purchases made on American Express cards each year, according to their website. Now, they’re also offering a High-Yield Savings account and CDs at very competitive rates. The American Express High-Yield Savings account boasts a 1.00% APY, with absolutely no fees and no minimum balance requirements. The nice thing about this account is that you can easily link it up to three of your accounts from external banks, so there's no need to switch banks. If this 1.15% APY beats the savings APY at your regular bank, you can simply transfer money back and forth between this American Express savings account and your other bank accounts. If you’re looking for something longer-term with a higher APY, American Express is offering a 3-year CD at 1.45%, a 4-year CD at 1.60%, and a 5-year CD at 2.15%. Before you open one of these CDs, you should be sure that you can invest it for the full-term of the CD. If you open an American Express CD with a term of more than 12 months, you can be charged a penalty of up to 6 months interest if you withdraw your principal or close the CD. However, since there is no minimum balance requirement to open one of these CDS, so you can invest as little or as much as you feel comfortable with. These rates are some of the most competitive on the market today. While it's possible to find a slightly higher APY, the brand-recognition of America Express, the no minimum deposit, and the no maintenance fees make these accounts enticing. Just be sure to read all of the terms and conditions before opening the account, like you would for any financial product. CNBBankDirect recently re-launched their website to make it a great resource for all types of financial advice. The bank also is offering a free savings account that pays 1.20% APY. CNBBankDirect, a division of Citizens National Bank, has been previously featured on BestCashCow.com, but the bank recently redesigned and re-launched their website to make it easier than ever to obtain not only information on the bank's products, but also general financial news and articles for the everyday consumer. This is a refreshing change from many bank sites that only seem interested in promoting their own products. The Savings News section of CNBBankDirect’s website includes articles on things such as identity theft, retirement health care costs, and how to use Twitter to solve credit card problems with your bank. The bank's About Us section also includes links to other financial websites, including BestCashCow.com, to promote well-rounded, educated consumers. Additionally, the bank is currently offering a high yield savings account that pays 1.20% APY. There are no monthly service fees, you need only $1 to open an account, and you earn interest on all balances $1 and more. You must open your account online, and you can link any non-CNBBankDirect checking or savings account and transfer money back and forth between them. Since CD rates have been so low recently, this bank account gives you a great way to easily earn a higher interest rate on your money but with instant penalty-free liquidity if needed. The Zions Bank Internet Savings Account is currently offering a 1.11% APY, yet it also has over 125 physical branches you could visit if need be. Recently, I discussed how many online-only banks, such as Bank of Internet, are able to offer better interest rates than many brick-and-mortar banks because they are able to keep their overhead costs low. But what if you just don't feel comfortable using an online-only bank? Even if people conduct most of their business via ATMs, the telephone, and online, some people just feel more comfortable knowing that there's a physical location they can go to if they have a problem, even if they never need to actually visit it. There's absolutely nothing wrong with that. However, do you always have to forfeit that higher interest rate for the security of knowing there's a brick-and-mortar location out there? Zions Bank may have found a solution to that dilemma. Zions has over 125 brick-and-mortar branches in the Intermountain West, it's headquartered in Salt Lake City, Utah and it's been in business since 1873. Zions is currently offering an Internet Savings Account at 1.11% APY, which is competitive with some of the best online accounts offered. You get the benefit of an Internet-only rate, but the peace of mind offered by knowing the bank has many brick-and-mortar locations. In order to get this rate, account balances must be $1,000 or more, and you'll need a minimum opening deposit of $100 or more. Interest is compounded daily and paid monthly, and there are no monthly maintenance fees. You can make unlimited withdrawals via ATM, by mail or in person; however, since this is an Internet savings account, you would be charged $3 per withdrawal if you make the withdrawal in person. Of course, you don't need to live anywhere near a branch to open this Internet account, but it would come in handy if you ever plan to visit a branch. This page was created in 0.6665 seconds.